Welcome to the Russian History Blog’s fifth “blog conversation.” The text that has inspired this conversation is Eric Lohr’s excellent book, Russian Citizenship: From Empire to Soviet Union (Harvard UP, 2012). This is Lohr’s second monograph, following his well-received Nationalizing the Russian Empire: The Campaign against Enemy Aliens during World War I (Harvard, 2003). The connection between the two projects is easy enough to see. His first book dealt with a particularly striking moment in Russian history, when the state and the engaged Russian public launched a furious campaign against alien subjects within the empire. They deported, denounced, expropriated, harassed, and otherwise persecuted a wide variety of merchants, businessmen, and farmers throughout the country in a very short period of time. The obvious question was: how did it come to be the case that so many foreigners occupied important economic positions in a land infamous for its purported insularity and xenophobia? 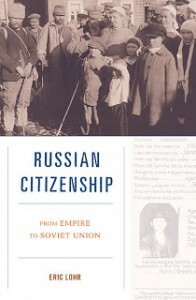 Answering this question led Lohr to investigate the history of immigration and emigration in imperial Russia, and this, in turn, led to ruminations on the very nature of Russian citizenship itself. Importantly, Lohr then continues this story beyond the caesura of rapid nationalization in the Great War to the policies adopted by the young Soviet state in the 1920s. The result is a book both innovative and fascinating. Lohr begins by describing the broad context of imperial migration policy, one he describes as “attract and hold” (p. 12). Ever since the Muscovite period, the Russian state had acutely felt its shortage of labor. This deficit helps to explain both the durable institution of serfdom and the state interest in attracting new workers to till its fields and to sweat in its mines. Simultaneously, the slow growth of a business community and of capital accumulation more generally led to a need for foreign capital and managerial expertise. For the same reasons, the state made emigration difficult for most people, most of the time. Still, as Lohr is at pains to argue, these labor and capital shortages did not lead to a consistent, much less uniform, system of citizenship or migration policy. Instead, the imperial state operated on an ad hoc basis, cutting many different “separate deals” (p. 20) with different ethnic groups. Lohr points out that this system came under pressure largely from exogenous forces. Russian statesmen began to borrow migration and citizenship practices from their neighbors, and they responded to the rapid changes in global economic and social systems occasioned by industrialization. “Pull” factors were more important to departing emigrants than “push” factors (p. 86), and the landmark new citizenship law of 1906 was “grounded in the same motives . . . to facilitate industrial development” (p. 116). Russian citizenship was thus intimately linked to the dynamics of the global economy. But there was another force at play as well: the police state. Paranoid ethnopolitics and official xenophobia were not mirages. They played a role in citizenship policy throughout the imperial era, and they were decisive in many aspects of Russian citizenship policy (in particular as it applied to Jews). Ethnopolitics only became dominant in the course of the First World War, for reasons Lohr explains in both of his monographs. Not only was the war the pre-eminent issue of the day, but it also largely shut the empire out of the global economy. It is hardly a surprise, then, that the policies of the young Soviet state more closely approximated the policies of the war years than those of the centuries that preceded the great European cataclysm. The closed nature of the Soviet system was therefore more the result of a conscious separation from the global economy (and the attendant destruction of the “lobby” for integrative citizenship and migration policies) than it was the result of an ancient Russian xenophobia. We have a group of talented commentators who will engage with Lohr’s book from a number of different angles. Golfo Alexopoulos has thought a great deal about citizenship and “alienness” in the Soviet context. She is associate professor of history at the University of South Florida in Tampa and the author of Stalin’s Outcasts: Aliens, Citizens, and the Soviet State, 1926-1936 (Cornell, 2003). She received her PhD in Russian/Soviet history from the University of Chicago in 1996, and her research has largely focused on the problems of Soviet citizenship and identity, Stalinism, and political violence. Her current book, Human Raw Material: Health and Inhumanity in Stalin’s Gulag, is under contract with Yale University Press, and will appear in the Yale-Hoover Series on Stalin, Stalinism, and the Cold War. Andrey Shlyakhter is also a Soviet specialist, but he has focused more on physical borders than citizenship ones. A PhD candidate in history at the University of Chicago, his forthcoming dissertation, “Smugglers and Soviets: Contraband Traffic, the Soviet Struggle against It, and the Making of the Soviet Border Strip, 1917-1939” uncovers the intertwined histories of Soviet efforts to inhibit illicit cross-border flows of value and to establish a specially-privileged and specially-policed band of territory running along the country’s border from Finland to the Far East. Alison Smith brings considerable expertise on the imperial era, particularly regarding the system of social estates that structured all aspects of imperial life, not least of them citizenship and belonging. She is associate professor of history at the University of Toronto, the author of Recipes for Russia: Food and Nationhood under the Tsars (Northern Illinois University Press, 2011), and is a contributing member of the Russian History Blog. Recent publications are: “National Cuisines,” in The Oxford Handbook of Food History, ed. Jeffrey Pilcher, 444-60 (New York: Oxford University Press, 2012) and “‘The Freedom to Choose a Way of Life’: Fugitives, Borders, and Imperial Amnesties in Russia,” Journal of Modern History 83, no. 2 (June 2011): 243-71. Her current work is a history of soslovie in Imperial Russia, currently titled The System of Social Estates in Imperial Russia. Annemarie (Ari) Sammartino approaches the issue of Eastern European migration from the other side of the (Russo-German) border. She is associate professor of history at Oberlin College. She is the author of The Impossible Border: Germany and the East, 1914-1922 (Cornell UP, 2010), which addresses the political and ideological ramifications of migration during and after World War I. She has also published articles on citizenship and asylum policy in interwar Germany, as well as paramilitary politics in Europe after World War I. She is now working on a study of urban and spatial planning in East Germany from 1949-1989, as well as a project on urban crisis and mass housing in New York City from 1965-2000. Last, but certainly not least, is the author himself, Eric Lohr. Eric is professor of history and the Susan E. Lehrman Chair of Russian History and Culture at American University, and his key publications are listed earlier in this introduction. We welcome comments from other readers as well, who should feel free to respond and hold forth as they see fit in the comments section!